Aly Raisman is doubtless one of the greatest Jewish athletes competing today, having just taken the silver medal for all-around female gymnastics at the Olympics in a year where all conventional standards ran out the door. But there are lots of non-athletic reasons to love Raisman. There’s her pride in her Jewish heritage (remember 2012’s Hava Nagilah floor exercise?). There’s her outspokenness— like when she expressed disappointment of the Olympic committee’s decision to not commemorate the 40th anniversary of the Munich Massacre. And of course, there are her parents, who react so viscerally and expressively to her competitive routines that you just want to scoop them up and tell them Aly will be fine. Because Raisman is a female celebrity, she’s been in the news this week for a public proposal to double date made by Colton Underwood, the tight end for the Oakland Raiders. The other couple on the date would be his teammate Andrew East and East’s wife, Olympic gold medal gymnast Shawn Johnson (who knows Raisman). In general, this was Not Cool. It’s really putting someone on the spot with some sort of romantic public proposal, and when you’re a female celebrity, there are all sorts of weird gender dynamics and extra pressure at play. There’s also been creepy speculating about what a great couple they’ll make, when they don’t even live on the same coast, and Raisman won’t be in San Jose until next month. But Underwood still made the video, and a Yahoo journalist still showed it to Raisman, so here we are. So let’s see how she did (You can watch the video here). As the video begins, despite trepidation, Raisman is pleasant, but generally impassive, keeping the upper hand while watching Underwood make his case. At the end of the video date proposal, she looks up. A good start! Raisman nonchalantly reveals that word of young Underwood has reached her (presumably from Johnson, who Raisman thinks has put the journalist up to this antic). She is prepared, but clearly not too giddy that she reached out to him when she first learned of his yearnings. “He’s very cute,” she continues, as she hands the phone with the video back to the reporter. Perfect! A compliment that sounds sincere without being overenthusiastic. The reporter asks Raisman if she knows who Underwood is (despite the fact that he said was an NFL player in the video AND that she says she heard about this). NAILED IT. Despite being put in a bad situation by a kind of creepy media (this video concludes that Underwood is a “boyfriend match,” despite the fact that they literally have not met yet. Ugh), with grace, Raisman accepts the date proposal and compliments the asker without seeming nervous, or even really impressed by his humble-brags of being a professional athlete (standing in front of the Raiders banner wearing a Raiders sweatshirt was a bit much, dude). I know Olympic gymnastic scoring isn’t on a 10 point scale anymore, but I’m not an Olympic Judge. 10/10. Raisman is the coolest. 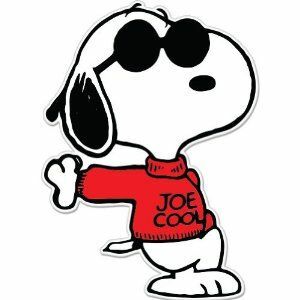 Cucumbers get the silver, and Snoopy wearing sunglasses and a sweater gets the bronze.